Extreme Performance V-Twin Primary Lube is designed for use in the primary chain case of all Harley-Davidson Big Twin Models and in the wet and primary/transmission common sumps found in Harley Davidson Sportster models with wet clutches sharing the same sump as the transmission gears. 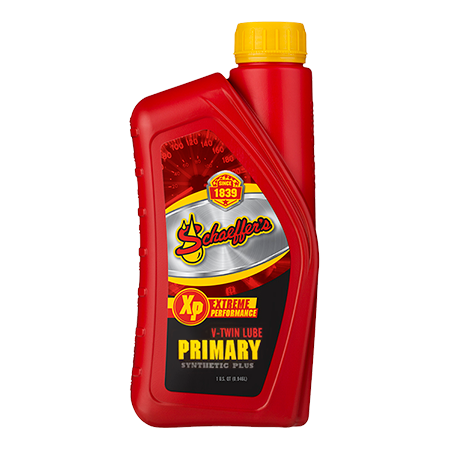 Extreme Performance V-Twin Primary Lube is made with the finest severely hydrofinished polyalphaolefin (PAO) synthetic base fluids and severely solvent refined, severely hydrofinished 100% pure paraffin base oils. Further blended into Extreme Performance V-Twin Primary Lube is an advanced additive package and Micron Moly® to create a powerful defense against wear and premature component failure. Efficient clutch performance and optimum torque transfer. Maximum transmission and primary drive chain reliability. Quickly penetrates into the chain rollers to loosen stiff links. Enhanced protection against rust and corrosion - even in the presence of moisture. Keeps components cleaner, reduces sludge and varnish buildup. Excellent oxidative and thermal stability.